How to dry flowers – it’s easy! There are a number of ways of drying flowers. Preserve your vibrant Summer garden in bunches, flower heads or just petals. Here are some of the most useful articles on this site about how to dry flowers. Basics of drying flowers – the best places to hang or lay flowers out to dry. Making a flower press – how I made a large press to suit my needs. How to dry petals to make wedding confetti – dried flower petal confetti is not only pretty but also biodegradable and venue-friendly, and you can make it from your garden. 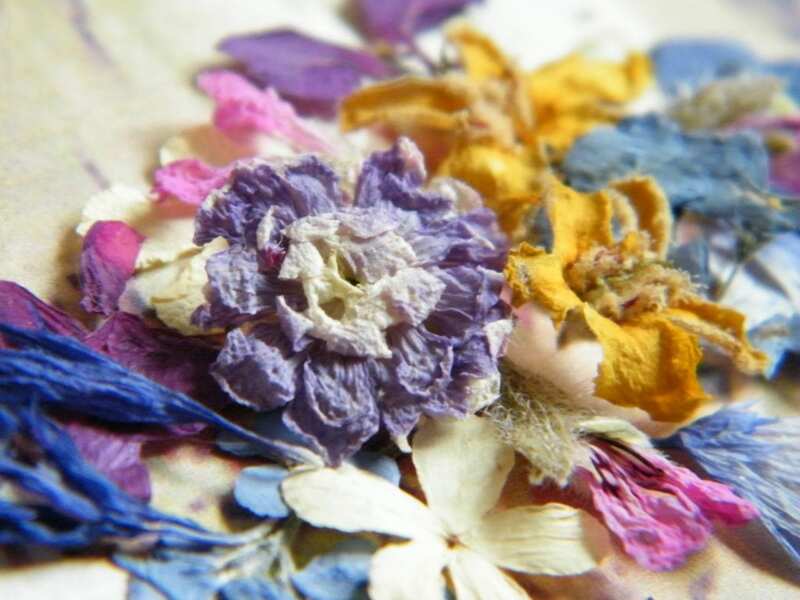 Drying methods including commercial dried flower techniques such as freeze drying. Drying flowers at home how, what and where. How to wire dried flowers – sometimes flower stems are brittle when dried, so replacing them can be the best policy. Preserving flowers by crystallising them – and you can eat them too! I have also experimented with silica gel for drying flowers quickly. Growing flowers from seed to dry – such as grasses and certain annuals. Drying lavender and roses from your garden. Drying cosmos flowers – the flat heads make a lovely pot pourri topper. Drying cornflowers sometimes fade during the process, but their beauty remains. Drying sea lavender by hanging it in bunches. Drying poppy seed heads – these are lovely in a mixed bouquet. Drying nigella seed heads – better to let them dry in situ than pick them prematurely. Drying hydrangea flower heads – I had to experiment a few times to get this right. How to dry chamomile flowers – these grew like weeds in my garden last year so I had to take advantage of the bumper harvest! How to dry lavender to make bouquets and lavender sachets. For more ideas, check out my how to dry flowers category.